The only top-10 sites that year not search focused were Fox and Viacom. People in 2006 went on the Internet to find something. Even if we extend it to the top 20, the only other “entertainment” site that shows up is Disney. Entertainment sites only made up 3 of the top 20, and there were no social media sites. Google has the top spot, but now 6 of the 10 most popular sites are social or entertainment related. Whereas the 2006 Internet was used to find specific information, the 2017 Internet is more used to see what’s out there to entertain you. You don’t go to Facebook, Reddit, Twitter, or Instagram because you’re looking for something, rather, you want to see what it has found for you. On the Internet in 2006, you were focused on pulling out what you wanted. Unless you were reading the news, whatever you read was something you had sought out. But now, most of your information is pushed onto you. You no longer enter the Internet the way you would a public library, where you browse and pick out what you want to read in peace, it’s more like the Las Vegas strip, where you’re bombarded with demands for your attention and need not exert any effort to be entertained. It’s a subtle change, and most of us haven’t noticed it happening, but it’s been damaging to our minds in a few ways. Ways that don’t feel evident in our day to day, but when we step back and look at them, are glaringly obvious. The clearest problem is what it’s done to our attention spans. How easily can you sit down with a book for an hour without checking your social media or email? Can you read through this whole article without switching to another tab or window at least once? What about at work, do you get a few hours of deep work without checking the news, email, or social media? Or do you jump around multiple times a minute? It’s easier to get that hit of intellectual nourishment from skimming through a list of “5 things you should do before 6 AM” on Business Insider than it is to get it from sitting down with a copy of Godel Escher Bach. Over time, as we keep getting that nourishment from “junk food” media instead of grappling with more challenging reads, we lose our ability to focus on challenging media at all. 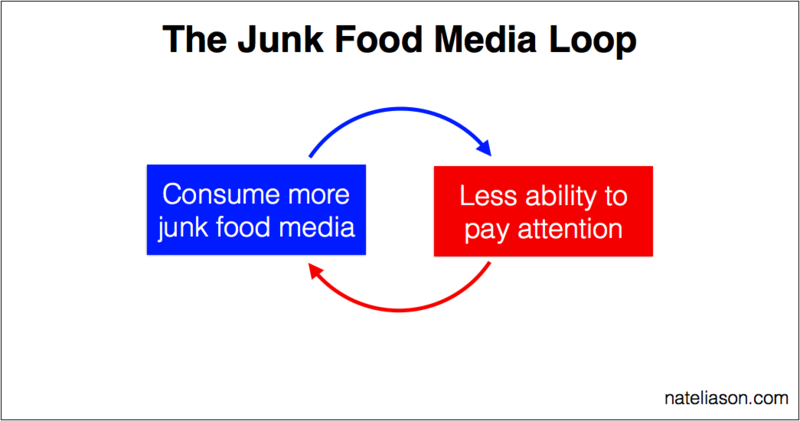 This creates a vicious cycle whereby continuing to not practice our ability to pay attention, our ability to do so gets worse, and we focus more and more on the junk food media. If you use the Internet in a way where you primarily pull for information you’re trying to find, your attention span stays intact. It’s not damaged by browsing for data online any more than it would be from browsing for data in the library. But in a social media and entertainment dominated Internet world where you get information pushed onto you, you will be continually drawn to the tastiest option, succumbing to click-baity titles and enticing images, progressively losing your ability to pay attention or even decide for yourself what you should be consuming. To satisfy the desires of an audience with the attention span of a goldfish, the only option is to simplify, shorten, and excite whatever media is being shared to make sure it holds the consumer’s focus. Next time you’re watching TV, try this. During a news segment or an advertisement, start counting the number of seconds before the camera switches. How high will you get? Unless you’re watching C-SPAN, it’s unlikely that you’ll get above 10 before the camera jumps. You might not even make it to 5. Why the switches? It’s a way to make sure you pay attention. If the camera stood still your eyes would take in most of the scene and then start to wander. But when your perspective moves around, you stay more engaged, like a hunter surveying the savannah. Camera jumping is relatively harmless, though. It doesn’t necessarily degrade the quality of the information, only our attention. What does degrade the quality of information is when it’s repackaged in such a way as to make it more interesting, or to make you focus on it. In 2017, the problem has magnified 10-fold, with the Internet and the preference of social media resulting in the vast majority of the information we consume being inert, low quality, and even fake. When you receive most of your information by having it pushed onto you via the News Feed, you’re subject to whatever Facebook has seen receive the greatest social signals via likes, comments, and amount of time people spend on the site being featured (yes, really). Facebook does not particularly care if the information is valuable, or well articulated, or useful, but rather, entertaining, so you keep returning to Facebook and clicking on ads. The problem doesn’t stop at getting low-quality information and news, though. Why do we see so many people on their phones while sitting together in restaurants? Addiction is one explanation, as is that by talking online all the time there’s nothing left to say, but a third possibility is that humans are too boring now. When you have a digital world in your pocket that’s meticulously designed to keep you entertained, why would you talk to someone else who’s just going to talk about something they saw on the Internet? When your life can be spent partying for free on the Las Vegas strip, it’s hard to choose to go to the library instead. This may be the most dangerous, and most subtle, issue arising from the switch from search to social. Every hour you spend on Facebook, Instagram, Reddit, or in another feed that pushes entertainment onto you, you lose some of that ability to go out and entertain yourself. And the closer a form of entertainment is to the “Las Vegas” side of the spectrum, the more damaging it is to your ability to self-entertain, and the more addictive it becomes. If you find yourself thinking of reading, going for a walk, having a long dinner, listening to an orchestra, or any “older” form of entertainment as boring, that’s a strong indicator that you’ve suffered from this rewiring of your dopamine receptors. Older forms of entertainment aren’t boring, they’re only boring relative to the level of stimulation you’re used to. If you fill your free minutes with the News Feed and Reddit front page, then yes, of course, old pastimes will be boring, but that’s not an indictment of the pastimes, it’s a warning sign of how addicted to the stream of entertainment you’ve become. Most of what we think of as ADHD is likely this rewiring. When a kid spends their free time illuminated by the glow of the soma dispensing iPad their parents gave them to shut them up, listening to a lecture by a 3rd-grade teacher is going to be horrifically boring. It would be weird if they didn’t display signs of ADHD. I imagine you’d be hard-pressed to find many kids who grew up without television and computers who show an inability to focus. And I should mention that “education” apps aren’t any better: they’re still designed to keep the kids engaged so that they don’t go to other educational apps, which means, you guessed it, bright colors and fast-paced action and screen jumping and any other excitement it can use to keep them engaged (and consequently less able to pay attention to teachers). Adults who graduated before the ADHD craze started just operate in different environments. At your desk job, you can flit between Facebook, Twitter, Reddit, and your actual work with relative ease. A student in the classroom doesn’t have these options. You get to indulge your media addiction, they don’t. Yet many adults get ADHD medication anyway to “get ahead” because it’s a simpler solution than stepping away from the cocaine pellet dispenser. These problems will all continue and amplify if we let them. The default behavior is to slip more and more towards entertainment, towards the News Feed, towards having our information picked for us and delivered on a platter. It’s an addiction: the more we feed it, the stronger it gets, and the less we recognize it having an impact on your life. But we still get to choose how much of it we consume, and there’s no reason you can’t switch back to focusing on searching for information, instead of letting it get pushed onto you.